Blog-a-Book-Scene is a monthly themed blogging endeavor from a group of authors who love to share s time? Genevieve Beaumont dreams of a handsome, unknown man almost every night—and has, for most of her lonely life. 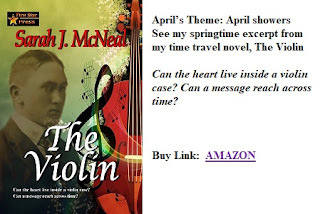 Inexplicably compelled, she buys a violin—and finds the remnants of John Douglas’s life and the mystery of his long-ago death revealed within its case. Intrigued, she makes a decision—one that will change her life forever. Is there a way to change the past and save this man who haunts her heart? When she finished eating what she could choke down, Genevieve decided to sit in a rocker on the porch and get hold of her nerves before she went down the road to meet John. The very thought of his name sent a little buzz of excitement to the pit of her stomach. Her skin tingled as if an electric breeze had blown over her. She chose a rocker near the climbing roses That twisted their fragrant way up the balustrade onto the roof. Once she set her bag down beside the rocker, she sat there for a few moments with her eyes closed. Genevieve took slow deep breaths of perfumed air and set the rocker into a slow, easy motion. For an actual minute, she was able to get hold of her run away emotions. Just be in the moment. There's nothing happening at this moment. I'm just sitting here, rocking on a porch with the smell of roses in the air. She relaxed her back against the chair, loosened the muscles at the base of her spine and began to hum. Ah, that’s much better now. After a few minutes of relaxation, Genevieve realized the time to leave had arrived. She tried to maintain her serenity, but it evaporated completely in the face of her excitement but the fear remained that she might lose her nerve. In an attempt to outrun panic, Genevieve bolted from the chair, picked up the brown paper bag, and almost ran down the stairs. She rushed across the gravel parking lot and down the narrow road that led to another time, and John.